My name is Chantal. My family owns this beautiful house since many generations, and me, mom Maria Letizia and sisters Serena and Marina decided to renovate and rent it after daddy passed away. Zina was the name of his boat: we used to sail the Gulf spending unforgettable summers in the most fascinating seaside in Liguria. Our father, Lorenzo has been living in Portofino when he was a child, and told us many stories of that period, including naval bombardments during 2nd world war, but also the faboulous '50es and '60es... At that time people could dive, swim and cacth fishes into the port during the day, and, after sunset, the smartest used to spend their best years having parties until sunshine, meeting in their stock-rooms in Calata Marconi. Those stocking - rooms, today, host the most famous restaurants and shops, turning Calata Marconi in the most elegant promenade in Liguria. Portofino was the place where you could enjoy a genuine, smart, and light-hearted lifestyle. Casa Zina is a special place, one of the largest houses in Portofino, with a stunning view on the harbor. The perfect location, right on water, large rooms, and a mix between modern and antique furniture show off the great personality to the house. Casa Zina is not only a house, it is a world where you can leave all the rest behind! One per floor: they have both a shower and bidet, and are decorated with the precious handcrafted ceramics from Vietri. Dish - washer available, washing machine ( clothes) available only renting the entire house (it is at the upper floor). Parking available at 100m from Casa Zina. No parking included in the rent of the house. Boat tours leave at 100m from Casa Zina. The best way to visit our amazing Gulf: San Fruttuoso, Santa Margherita, Cinque Terre and Genova can be easily reached. Terrace at the third level, available renting the entire house. Camping bed for kids 0-4 available free of charge. Air conditioning and heating on both floors, TV LCD, washing machine, hair dryier, dish washer, free Wi-Fi. Taxi Service available on demand fro transferts from the airport ect.. Thank you for sharing your home. The best location ever! Casa molto accogliente, proprietari gentili e disponibili! Siamo stati in nove e siamo stati molto comodi. La casa è molto grande e in una posizione fantastica! Posizione ottimale per raggiungere in poco tempo altre località come santa margherita. La casa è ben fornita di tutto ciò che serve x trascorrere una vacanza con gli amici. Ci ritorneremo sicuramente, soprattutto x la gentilezza dei proprietari! A beautiful apartment overlooking Portofino. Very comfortable and spacious with 2 good size double bedrooms plus a twin with two bathrooms and a kitchen. Best entered from the street. The owners were very helpful with information before our arrival and very understanding when we had to leave earlier than planned. We would definitely stay in Casa Zina again if we return to Portofino. Portofino (Ligurian: Portofin) is a small Italian fishing village, comune and tourist resort located in the province of Genoa (at 36km) on the Italian Riviera. The town is crowded round its small harbour, is closely associated with Paraggi Beach, which is a few minutes up the coast. Other nearby beaches include Camogli, Chiavari, Lavagna, and Sestri Levante. Casa Zina is in the heart of Portofino, Calata Marconi: just forget your car, and walk or sail! Our Guest can consider joining Casa Zina by boat, from Genoa or Santa Margherita Ligure, or by car (we can book a private car with driver for you). Once arrived, be aware you are in a magic place, where you can leave behind stress, and warnings. 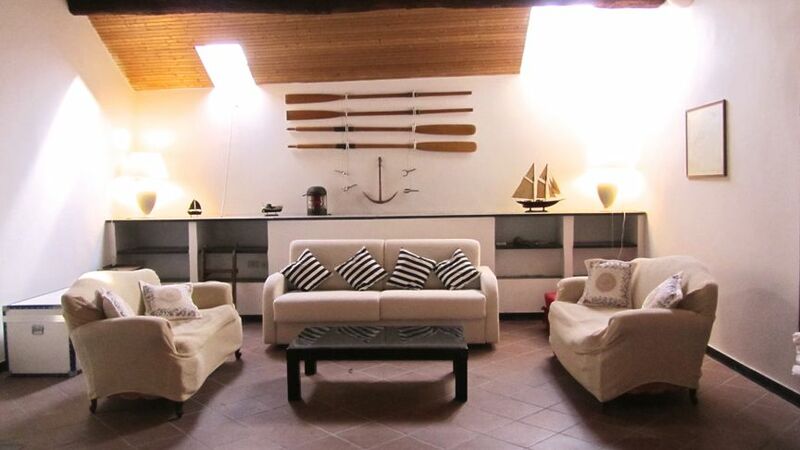 Casa Zina has two entrances, one is in Calata Marconi, full of restaurants, the beautiful promenade where you can have a drink, or take a boat and sail away! The other entrance is behind the building, on the road that leads to santa Margherita (called Vico Chiuso). Golf: Circolo Golf e Tennis Rapallo, 9 km. DISCOUNTS AVAILABLE FOR RENTING ONLY ONE FLOOR, UP TO 4 PEOPLE (IT DOES NOT INCLUDE: UPPER FLOOR, TERRACE, WASHING MACHINE). SEE BELOW ONE FLOOR FARES: EASTER 2018 (MARCH 29TH - APRIL 4TH): 320€ per night /1600€ per week. MARCH 1 - 28th- APRIL 4th - 30th- MAY - JUNE - OCT: 1700€ / WEEK - 340€ / NIGHT SEP: 1850€ / WEEK - 370€ / NIGHT JULY: 2400€ / WEEK - 480€ / NIGHT AUGUST: 420€ / NIGHT - 2100€ PER WEEK NOVEMBER - DEC.16TH 2016: 360€ PER NIGHT, 1800€ PER WEEK. XMAS - NEW YEAR'S EVE (except special offers) 420€/NIGHT, 2100€ PER WEEK. *FARES INCLUDE: LINENS, CHARGES INCLUDED. FREE WIFI. **CLEANING FEE NOT INCLUDED: 100€ FOR ONE FLOOR ONLY OF THE HOUSE, FOR CLEANINGS MADE ON CHECK - OUT DAY. ONLY EUROS ACCEPTED. ***DAMAGE DEPOSIT: 500€ (CASH, OR PAYPAL, WILL BE REFUNDED AFTER A CHECK ON DEPARTURE DAY). ****CLEANING FEE ONLY CASH ACCEPTED.